I collected Andy and Lia from Alnwick and we set off for a day birdwatching on the Northumberland coast from Bamburgh to Druridge Bay. Knot, Turnstone, Oystercatcher, Curlew, Sanderling and some very elusive Purple Sandpipers started the day for us, as Linnets fluttered around in the long grass, Meadow and Rock Pipits were around the tideline, Gannets were soaring majestically by and Eider and Common Scoter were bobbing around just beyond the surf and a mixed flock of Common and Sandwich Terns were flushed by walkers before settling back on the rocks close to the breaking surf. Offshore a small flock of birds grabbed my attention, and through the telescope resolved into one of Northumberland’s winter specialities; seven Pale-bellied Brent Geese steadily heading north were our first of the autumn. Further south, waders were still the main focus of our day; Dunlin, Redshank, Greenshank, Snipe, Whimbrel, Black-tailed Godwit, Bar-tailed Godwit and Ruff were all pottering about in the water’s edge. When we arrived at East Chevington to look for the Spotted Crake, there were a few local birders already there. With an astonishing amount of luck, we’d arrived just as a White-rumped Sandpiper was being watched 🙂 Not the easiest of birds to identify, but as it wandered around a flock of sleeping Teal with Dunlin and Snipe alongside for comparison it stood out quite well. We rarely let the weather get the better of us. Apart from our annual programme of North Sea Pelagics, where the weather really can make a difference to a trip going ahead or not, we can pretty much cope with anything the elements throw at us. I collected Harry and Maureen for their mini-safari on the North Northumberland coast as the first drops of rain began to speckle the windscreen of the car. Straight down the coast and we were soon watching Eiders and Common Scoter riding up and over the surf, Guillemots, Puffins and Razorbills loafing offshore, Gannets and Fulmars soaring effortlessly over the sea, Swallows hawking insects within a few feet of us and Rooks foraging around the car park in search of discarded morsels of food. All of this was in heavy rain, but positioning the car at just the right angle to the wind made it possible to watch all of these birds and the dark majesty of the sea as a backdrop. Along the coast towards Holy Island a huge group of Grey Seals were basking in the improving weather and, all too soon, it was lunchtime and the end of the trip. I collected John and Jennifer from Church Point and we drove northwards along the Northumberland coast. Arriving in Seahouses, ready for our Seal Cruise on Glad Tidings V, conditions were near perfect; beautiful blue sky, calm sea and just the slight breeze that always seems to be present on the coast, even on calm days. As the distance between ourselves and the mainland increased, streams of Fulmars, Kittiwakes, Puffins, Guillemots and Razorbills were heading to and from the islands, Gannets were passing by in impressive groups, Cormorants and Shags were sitting like sentinels at the gates of some mystical wildlife world and then we came across the seals. Bathing in the sunshine, and only occasionally lifting their heads to avoid unexpected sprays of breaking surf, they allowed a close approach that had an entire boat full of camera-wielding visitors clicking away like a knitting circle. Back on dry land we sat and had lunch, just along the coast from the impressive bulk of Bamburgh Castle, and then continued north to look for more seals. As high tide approached they could be seen ‘bottling’ close to Holy Island, and we made our way back down the coast. Saturday 03:30 and the alarm clock starts ringing. After eight long days out of the office, things were going to be topped off nicely with an early start for our ‘Dawn on the Coast’ Beginners Photography session. I arrived just ahead of Dave, and met up with Steve who had arrived early. 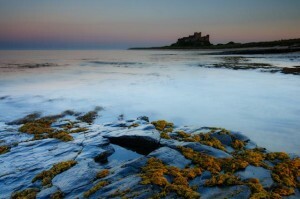 In the shadow of Bamburgh Castle, with the North Sea washing close to our feet, we worked our way through the holy trinity of photography (shutter speed, aperture and ISO) and various compositional techniques as the approaching dawn illuminated the landscape around us. Snow, driven by a strong northerly breeze, passed by almost horizontally and the broken cloud to the east produced intermittently good lighting conditions. Red-breasted Mergansers and Fulmars flew by, Common Scoters and Eider were riding on the swell, Purple Sandpipers crept around the base of the rocks and we finished our session as less amenable weather approached from the east. Friday was a safari on the North Northumberland coast for Kathryn and Linda. As I collected them from the Lindisfarne Inn, the biting wind carried a flurry of snow, and I guessed this could well be a day for birdwatching from the warmth and comfort of the car. Over the next few hours we had close views of Bar-tailed Godwit, Dunlin, Redshank and Oystercatcher as they probed in the mud, seemingly oblivious to the breeze, a Peregrine shot by, menace on pointed wings, and a Brown Hare sat majestically in the middle of a field. From the car park at Stag Rock we could see the MV Danio, still stranded near the Longstone lighthouse, as Common Scoter and Eider rode up and over the impressive swell and Gannets battled into the breeze. Black-headed Gulls and Rooks were almost perched on the car, and the South Low below the Holy Island Causeway offered impressive views of Eider, Long-tailed Duck and Scaup. So, when the alarm went off and I looked out of the window, I was quite surprised that there was a good covering of snow. A few minutes later the snow started again, and I wondered what conditions would be like in the north of the county. It turned out that we were near the northern edge of the snow, and as soon as I was through Morpeth and on the A1 there was just an occasional light flurry, and no snow on the ground. I collected Emily and Warren from St Cuthbert’s House and we headed straight for Holy Island so that we would be on the island for a couple of hours before the tide encroached onto the causeway. Dark-bellied Brent Geese were roosting and bathing in the Rocket Pools, Curlews were feeding in the fields by the Crooked Lonnen and a lone Fieldfare hopped along the track ahead of us. We could see that the weather was doing something ‘interesting’ out beyond the Farne Islands, and the icy wind coming in off the sea made it a day to really appreciate the resilience of our wintering birds. As we left the island, flocks of Lapwings were being blown on the breeze, Pale-bellied Brent Geese and Bar-tailed Godwits were working their way along the edge of the incoming tide and Eider and Long-tailed Duck were in the South Low, competing for the title of ‘most attractive duck of the day’. Kestrels were a regular feature of the morning, and we enjoyed good views of nine very obliging Roe Deer. Driving back down the coast, I could see that the ‘interesting’ weather seemed to be over Bamburgh Castle and Seahouses, so it was no surprise that snow started to fall as we passed Budle Bay. Then it got heavier…and heavier. Eventually, as we reached Stag Rocks, there was an incredible blizzard coming in off the North Sea, reducing visibility to only as far as the shore. Emily jumped out of the car as soon as we’d stopped, revelling in the snowfall; I’m not the only one who enjoys the winter and really loves snow 🙂 As the blizzard passed over us and made its way inland, the Farne Islands gradually faded into view and we made our way back to Seahouses. With the cessation of the rain that plagued Sunday, Monday and Tuesday, Wednesday dawned cold and breezy; almost ideal for a day out on the birdwatching paradise that is the Northumberland Coast in the Winter. As daylight faded a flock of Waxwings were in the distant tree tops and two species that are always a pleasure to see put in an appearance. 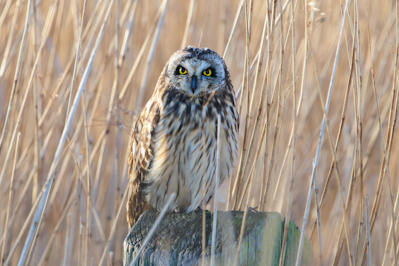 Short-eared Owl and Barn Owl drifted along the edges of the reedbeds; death on silent wings. Here are a couple of pictures of them from earlier this year (in better light and a gentler breeze!). Having lived on, or near, the Northumberland coast for 15 years (apart from my 6 month sojourn to Texas and Arizona) it’s a location I return to time and again with my camera/binoculars/telescope/camcorder/sound recording gear (delete as applicable depending on my mood and/or aim for the day). The coast is my favorite location for one-to-one photography tuition with clients too (although the North Pennines AONB runs it pretty close!). I drove down to Wallsend to collect Mac for his day of photography tuition, and we set off along the coast of southeast Northumberland and Druridge Bay. I’ve always seen dilapidated farm buildings as ideal locations for Little Owl and Barn Owl, but one group of buildings made an ideal location to explore the reciprocal relationship between shutter speed and aperture, before we headed north and Mac added immeasurably to my knowledge of the opencast mining operations of the area. Next stop was on the top of the dunes overlooking the north of Druridge Bay and, as well as the impressive scene looking across the rolling surf out to sea, a high-tide wader roost was building up on the rocks below us. Redshank, Turnstone, Oystercatcher and Curlew were all arriving as the surf lapped at their feet. Then they all scattered. 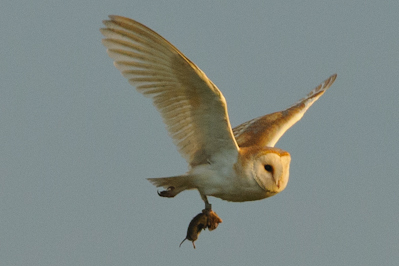 Sadly this didn’t herald the arrival of a Peregrine or other predator…but, instead, a jogger. As luck would have it, I was due at a meeting with a Lead Adviser from Natural England a few days later, to discuss coastal activities and wildlife disturbance. The conclusion of a brief discussion at that meeting was that jogging through a high-tide wader roost in a SSSI is mindless stupidity, sheer ignorance and possibly an offence. People really should know better. Boats at Boulmer and Holy Island came under the focus of Mac’s camera before we arrived at our final location for the day. Breaking surf, rock pools and the Northumberland coast’s stunning edifice of Bamburgh Castle provided our last shoot before the sun dipped behind the dunes and out of sight, and we headed back south. The light wasn’t the best, although it was a good day to experiment with exposure settings, so here’s a shot of Bamburgh Castle in the sort of conditions that I really enjoy. There’s always something special about days out with clients who have a connection with the north east; often we’ll visit locations that they haven’t seen for a long time, and they’ll share their memories of the place. One thing that’s constant though, is that they always have a passion for Northumberland, no matter how long they’ve been away, or where they live now.